Speaking of laundry, I hate it. I hate washing it. I hate drying it. I hate folding it. I hate it. I don’t know how me, my husband and my 5 year old can accumulate so much dirty laundry within a week. I. Don’t. Get. It. I’ll tell you what else I hate…I hate buying laundry soap. I’m pretty sure most laundry soap we buy is 95% water. It’s way too expensive and if you buy the cheap stuff your clothes suffers the consequences. SMH! I wish I could tell you who I got this recipe from but the truth is that I’ve tweaked it so much that I wouldn’t know who to give credit to. This is super easy to make and can save you hundreds of dollars a year! YES…I said HUNDREDS! Cast of characters: Oxi Clean – $7, Zote bar soap – $ 0.97, Fels-Naptha bar soap – $0.97, Super Washing Soda – $3.24, Borax – $3, Baking Soda – $2.24 and a container to store your soap in – $5. 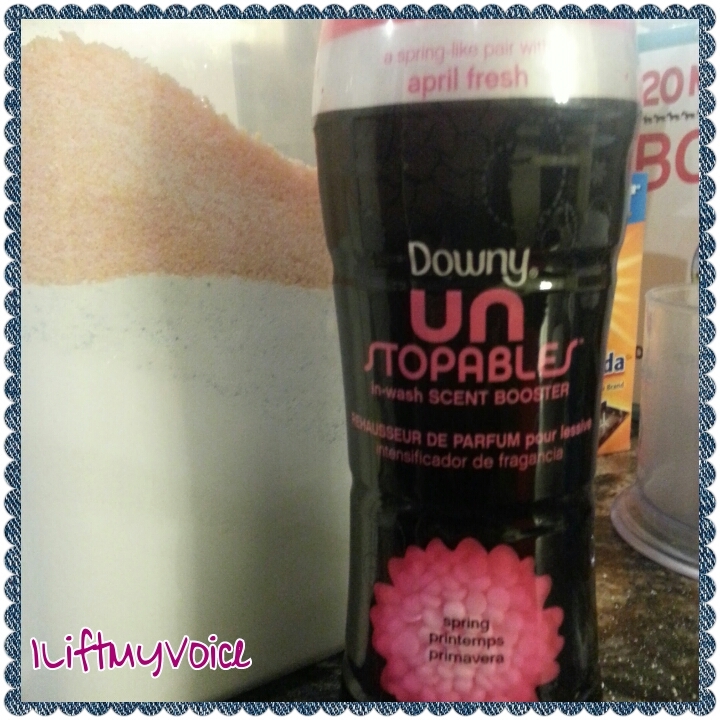 Optional: Downy Unstopables -$6. 1. 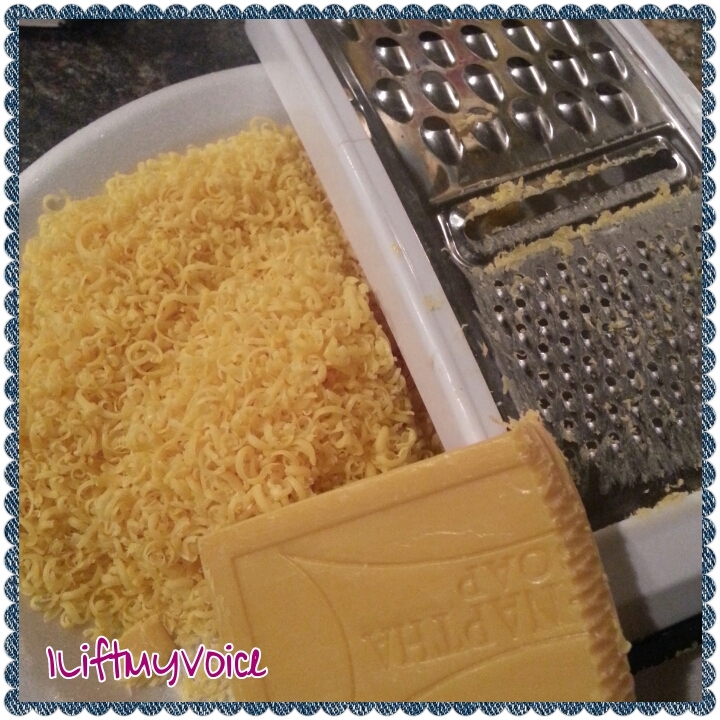 You want to begin by grating 1/2 of the Fels-Naptha bar with the smallest sized grater you have. Side Note: Fels-Naptha: The soap comes packaged in paper similar to bar body soap and is most often found in the laundry section of a supermarket or grocery store. It is intended for the pre-treatment of stains by rubbing the dampened product on a soiled area prior to laundering. The manufacturer claims it to be most effective in removing chocolate, baby formula, perspiration, and make-up. The brown soap is particularly effective in removing the sap of poison ivy, where it has touched the skin but not yet inflamed the area. Side note: Zote: It’s gentle on delicates and baby clothes, gets out tough stains and brightens whites. But that’s just the beginning. Zote may be the world’s most versatile household soap – use it for laundry, bathing, dishes, and it even helps keep the bugs away! 3. 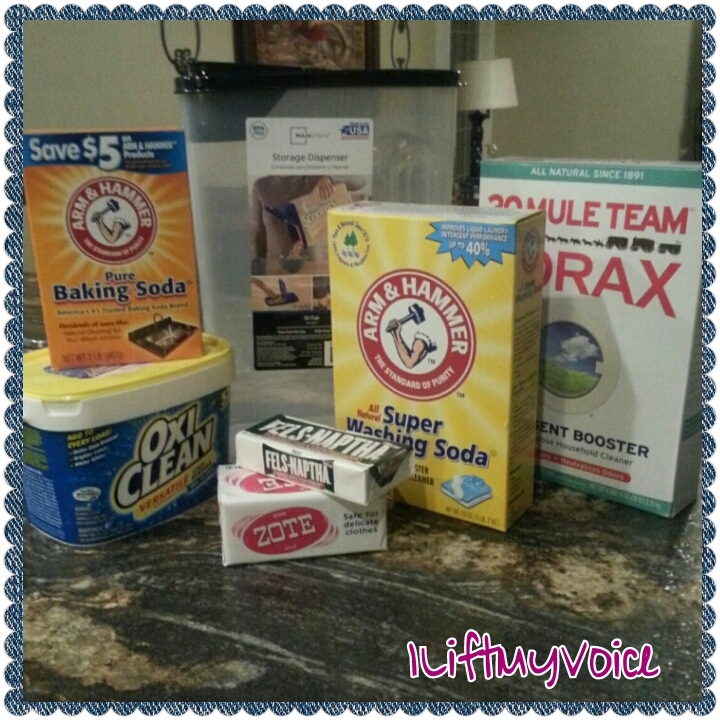 Put your powder concoction aside and pull out the Borax, baking soda, washing soda and Oxi Clean. You are going to pour two heaping cups of Borax and washing soda into your storage container. 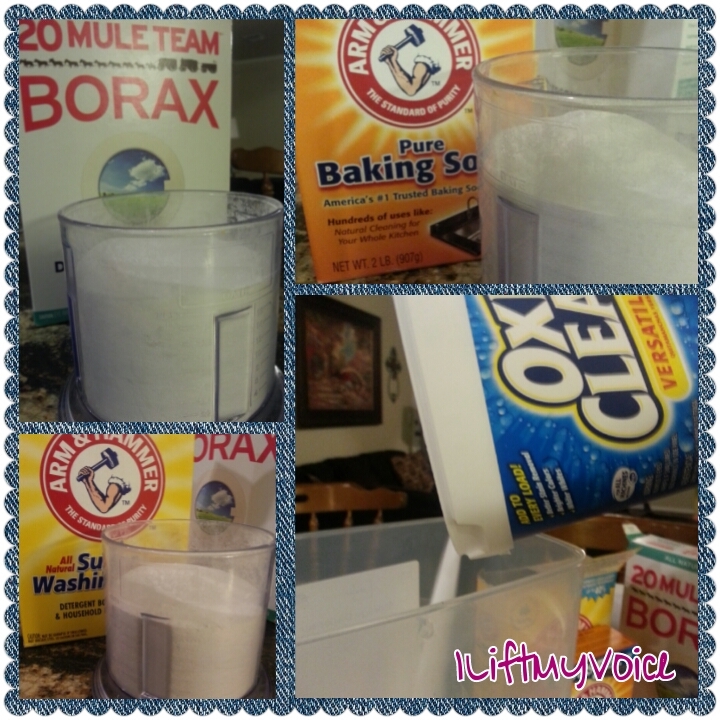 Then pour the entire tub of Oxi Clean and the entire box of baking soda into the container. Side Note: Why Baking Soda? – It is less alkaline than soap and much less alkaline than other cleaning products such as chlorine bleach. This makes it excellent for use as a cleaning product, as the skin can stand prolonged contact with that. 4. Next you will add the Zote and Fels-Naptha mixture to the storage container. 6. This is what your mixture will look like. The next step is to shake it like a salt shaker….but MAKE SURE THE LID IS SECURE. Don’t get too crazy. Lol. 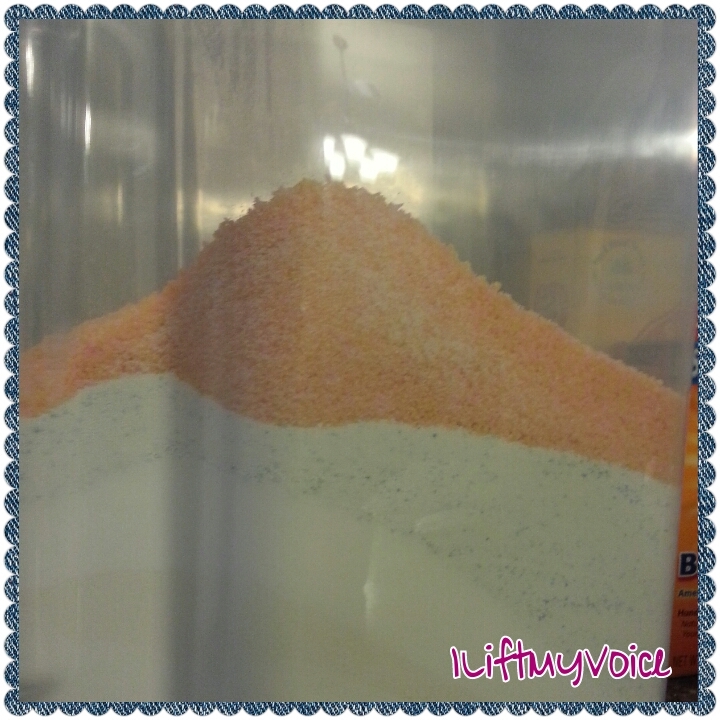 After you are done making your detergent you can put the rest of the soap bars in a plastic baggie and store them for the next batch! 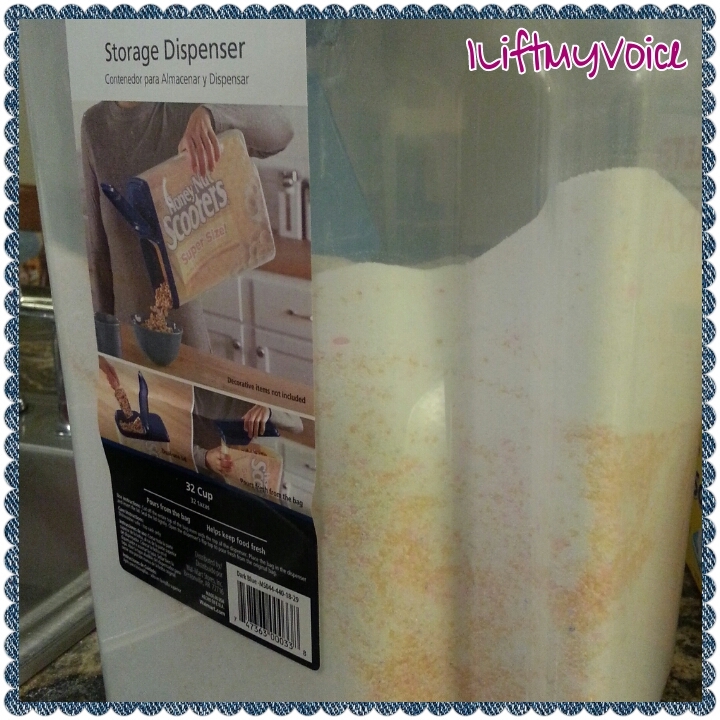 I hope this helps your family cut back on spending money on water based detergents and I hope you love it as much as I do! 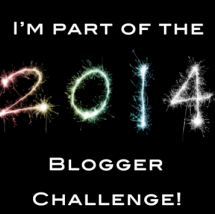 Oh…and before I forget! The way I tested this detergent was by washing my stinky kitchen rag (after a good day of cleaning and degreasing) with a load of towels. 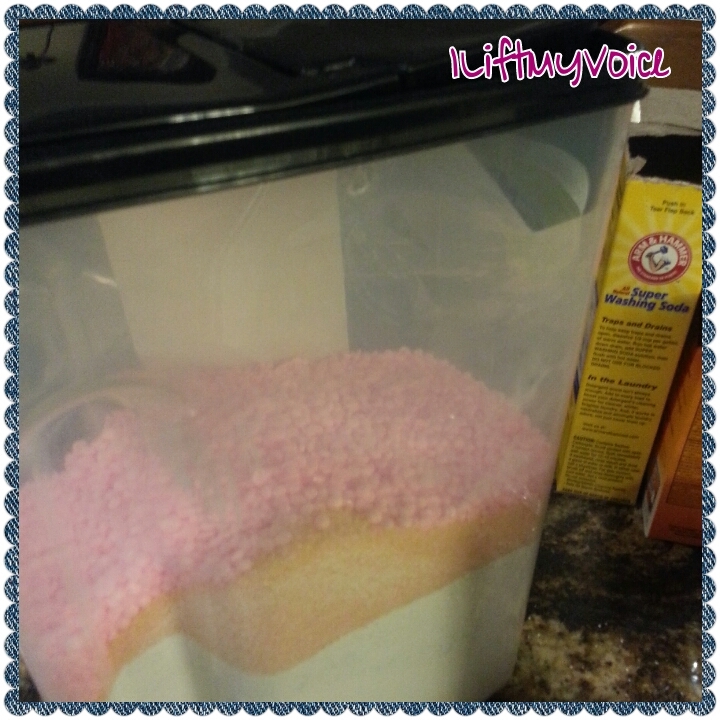 I used the 2 tablespoons and when the load was done I was proud to say that my kitchen rag was clean as a whistle! Try it! 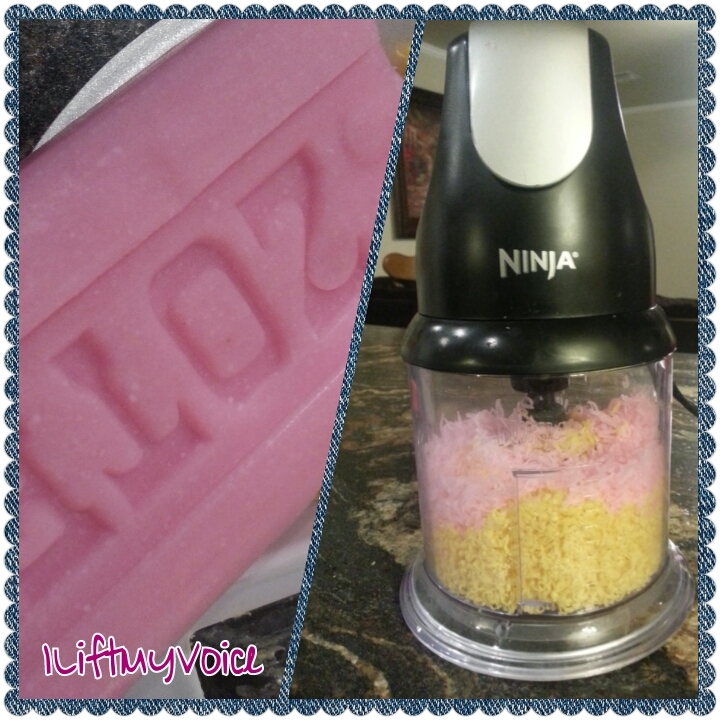 This entry was posted in DIY, Recipes on March 17, 2014 by Monica.